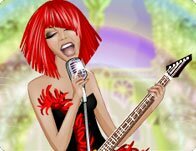 Description: She's a music enthusiast with an urban style and a rock n roll smile. Dress this designer doll in fashionable, danceable clothes that hip, hop and pop! Instructions: Use your mouse to click on and through the floating clothing, hair, accessory, headphone and background options. This young musician is gifted. She plays her instrument beautifully. Create a symphony of style for this young prodigy.